This series of articles is designed to give you enough information to at least determine where I’m coming from, and what you might expect from my professional search engine optimisation services and/or my SEO seminar and workshop. For those who have certain skills (e.g. copywriting, marketing, web development) and/or relatively modest goals, they may be all you need to move forward on your own. If you quote (or benefit) from any of the following, I request only that you reward the content with a link. Cheers all. Contrary to popular belief, a virus does not have to infect bodies at an exponential rate to be worthy of the name. If this were the case, we’d all be dead by now (or eating McDonalds Burger King and drinking Coke Pepsi all day, which amounts to much the same thing). Plenty of viruses succeed without spreading beyond a single community, and in terms of viral marketing and how it can work in conjunction with search engine optimisation, sometimes a single community is all it takes to initiate a high search result. Once it is accessible via top search results for a popular/relevant search query, a page/site hosting a commanding idea (i.e. a virus targeting the mind) can be very difficult to shift, as it quickly becomes self-reinforcing. Starting with an imperfect example (a famous Google bomb that started here at Bloggerheads), the following short list should help you to grasp this concept very quickly. I’ve chosen older mechanisms mainly to show off the sustained effect, because what I’m trying to get across here is the potential of a long term gain from what is typically a short-term exercise (most viral marketing mechanisms on the internets especially come and go very quickly). In early 2005, I deliberately linked to Tony Blair’s biography on the Downing Street website using the single word ‘liar’, prompting maybe a dozen bloggers to do the same. Very shortly after that, Tony Blair was the top search result for ‘liar’ for UK users of Google. This quickly gained media attention, which led to many others either referencing the Google bomb (helping to further associate Tony Blair with the dreaded word) or actively participating (reinforcing the search result). Soon, Tony Blair was moving from 5th to 3rd globally for ‘liar’, leading to further mentions in international media… and so on and so forth. Also in early 2005, I created a Flash music video for a song about the London underground system, titled The London Underground Song, which was a smash hit (in online terms) for a few short weeks. But five, even seven years later, my Flash video still hovered between 5th to 7th place for the generic query ‘london underground’, which helped it to reach over a hundred new fans every day. A small percentage of those fans then went on to link to the video, which further reinforces its importance in the eyes of Google… and so on and so forth. The host site is long-gone, but there are now dozens of versions of this song all over the YouTubes, and you can see the original Flash-created video here. In these examples, a relatively small audience helped to secure a high search position that went on to reach an entirely different – and much larger – audience. This is what is unique about my approach to viral marketing; if the concept is properly integrated into a search engine optimisation strategy, this can help you to get far more bang for your buck, possibly long after your attention-getting device has peaked (if you have the relevance to back it up). Alone, keyword relevance has you sitting in a grounded glider, going nowhere. Using only a viral marketing mechanism (i.e. without keyword relevance to back it up) is like nailing a propeller to a brick, or strapping a jet engine to a cow; you may well get airborne, but the moment the thrust cuts out, you’re on your way down… fast. But when these two forces act in unison, a viral marketing mechanism can within days (and sometimes hours) elevate you to heady heights of visibility, allowing you to glide forward and stay aloft on your keyword relevance for years. Continuing the metaphor, and returning to the Tony Blair ‘liar’ example, the very best viral marketing mechanisms (see also: memes) are less about thrust and more about taking advantage of massive thermal updrafts; the ‘liar’ Google bomb worked as spectacularly as it did because an election was looming and at the time 44% of voters agreed that Blair had (at least) misled Parliament about Iraq. Whatever you believe personally, that’s a heck of a lot of updraft. 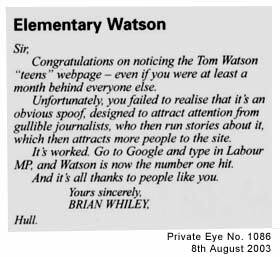 It should also be noted that Tom Watson especially owes a lot of his success to his willingness to engage openly and honestly with the electorate via his weblog (and more recently on Twitter), and it is on that note I would recommend you read Relevance #2 if you haven’t already. If you’d care to learn more, I use these case studies and others to explain in more detail how this method works (and why) in my search engine seminar.